Sidney Crosby led the Penguins to a 2-0 first-period lead before the Avalanche scored three unanswered goals to earn the 3-2 victory. Sidney Crosby did everything Denver hockey fans could have hoped for in his first visit to the Mile High City: He put on a show, scored two goals – and lost. Crosby beat Jose Theodore twice in the first period to give the Penguins an early lead, but the Colorado Avalanche rallied with three goals in the second period and held on for a 3-2 victory on Thursday night. The victory was the Avs’ sixth in a row without a loss at home, matching the franchise record set in 1994-95, while the team was based in Quebec. Colorado and Philadelphia (4-0) are the only remaining teams that are unbeaten at home. A sellout crowd saw Crosby give the Penguins the lead at 10:21 of the opening period when his attempted pass hit a defender’s skate and deflected past Theodore. 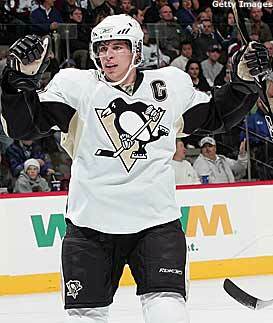 The goal extended Crosby’s points streak to 11 games. He made it 2-0 at 18:07 during a power play when he took a pass from Evgeni Malkin and ripped a shot from the slot past Theodore’s glove. Colorado coach Joel Quenneville could only sit and watch Crosby. But it was also fun for the packed house to watch the Avalanche rally with three goals in a 3:30 span of the second period. Defenseman John-Michael Liles got the Avs on the board at 10:26, Wojtek Wolski finished off a three-way passing play 31 seconds later and Ben Guite scored his first goal of the season by beating Dany Sabourin with a backhander at 13:56. The Penguins had some chances in the third period but were unable to get the equalizer against Theodore, who finished with 25 saves. Crosby, who’s visiting Northwest Division cities for the first time, had a goal and three assists in Tuesday’s 4-2 win at Minnesota and is showing fans who haven’t seen him in person that he’s every bit as good as advertised. He enjoyed his first visit to Denver – except for the final score. “When you get an opportunity to come to a place like this, Colorado or Minnesota, places that support their team a lot and are big hockey fans, it makes for a great atmosphere, a great environment,” Crosby said.